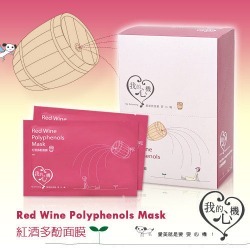 Effects: Red wine polyphenol have highly anti-oxidant content which restores the lightness and brightness of skin. It also gives you a rosy complexion. Most importantly, it prevents aging and cell damage problems, stabilizing blood circulation for healthy complexion with its vitamin E.
Effects: The cool sent of mint is a good material to refresh our brain. The mask’s advanced moisture factor prevents skin from dryness, coarseness and aging. It improves and renews skin cells. 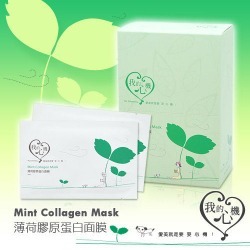 Collagen improves skin elasticity and moisture, providing you with a healthy and sheeny skin. 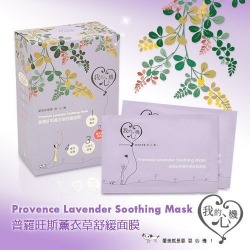 Effects: The lavender extract in the mask can not only balance sebum secretion, the fragrance can calm and relax your mind. It is specially formulated for sensitive skin to soothe and tighten your complexion. With other extracts of chamomile and hyaluronan, the mask will improve skin elasticity, giving you smooth and radiant skin. Effects: The natural camellia extract increases the moisturizing and soothing function, it also repairs skin. It prevents moisture loss. It also revitalizes your face for smooth and radiance effect. 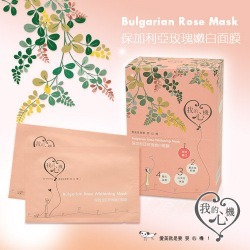 Effects: Rose Extract deeply moistures skin and improve uneven skin tone. 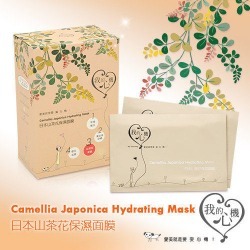 Hyaluronan in this mask helps skin to replenish moisture. A protective layer preventing moisture loss is left on the skin upon using. Your skin restores the normal tension for a delicate and smooth look.